The Spirit of Elbe Organisation. 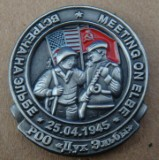 The Russian public organisation " The Spirit of Elbe", Moscow, in partnership with the Veterans Union undertake educational activities and conferences dedicated to the commemoration of the anniversary of the meeting of the Allies in April 1945. With time, the memories of that powerful moment on the Elbe have faded but it is necessary to keep the recollections of that profound meeting alive for future generations. The mission of "The Spirit of Elbe" Organisation is to ensure these historic events are not forgotten and to promote subsequent understanding and peace between nations. Members of 13th Guards met representatives of "The Spirit of Elbe" Organisation at Torgau during the commemorations on 25th April 2015. Members were presented with " The Spirit of Elbe" medallions by the head of the Organisation, Colonel Zarina Vashurina.